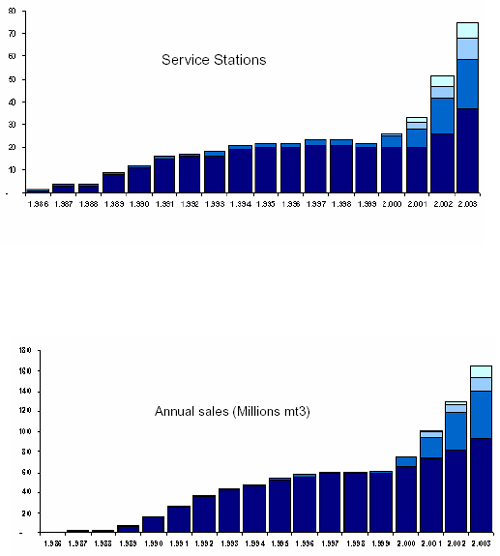 – More than 35,000 NGV’s -Over 80 refuelling stations -Anual consumption amounts of 60 million+ cubic meters of gas -Steadily growing sales of 20% per year -Natural Gas used in all vehicle types. 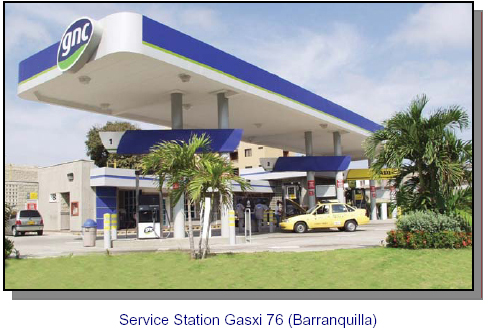 Colombia’s experience with NGV dates back to year 1984, when PROMIGAS S.A., the oldest private Colombian company in Latin America in natural gas transportation and distribution, installs the first NGV stations and conversion shops in the Atlantic Coast, in order to offer their customers an alternative fuel that would provide them a higher economy and operation security, and would additionally contribute in the reduction of the high pollution indexes that are affecting the environment. 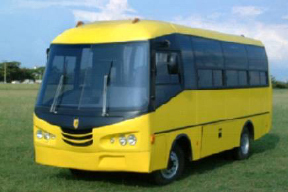 This is how the project started with public transportation, specifically with fuel powered buses, and slowly developing the initial conversion processes. At the beginning, many difficulties were found in order to convince fleet owners and managers of the product’s benefits. At the end of year 1999, gnc S.A. is established as a stand alone company, with the purpose of speeding up the business and making it grow all over the country. The arrival of natural gas to other country areas has allowed the business to have a satisfactory development in Bogotá (capital city), to the East and West of Colombia South America. Today, natural gas in Colombia is considered as an alternative fuel, not only for heavy vehicles as buses that consume large amounts of fuel, but also for small vehicle fleets such as taxicabs, vans, automobiles, etc. This is how other markets are being attended in the Atlantic Coast as well as in the inner zone of the country nowadays. 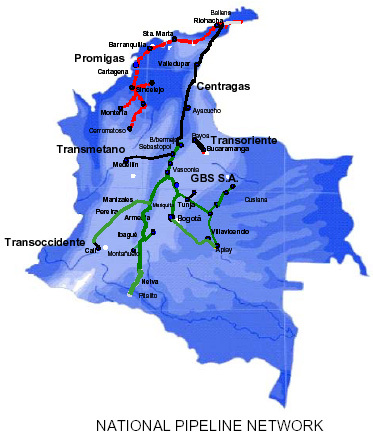 Since the late 1990’s till today, 80 new service stations have been built in Colombia in 16 different cities, and around 35.000 vehicles are now operating with natural gas, reaching consumption amounts of 60 million cubic meters of gas during 2003, which replaced the equivalent consumption of approximately 56 million gallons of fuel, and sales have been growing steadily 20% per year during the last three years. The expectations for 2004 are to increase the market penetration of taxicabs and individual vehicles by building new service stations through all the Colombian territory, with which the leadership in the national market is consolidated. In addition, it’s expected a 100% growth in conversions according to 2003 accomplishments and it’s projected to sell 27% more than the registered during the same period. The converted motor park market distribution in Colombia is conformed mostly by automobiles, most of them cabs with 42%, urban buses with 26% , vans and jeeps with 27% and trucks with 5%. • Strengthen the commercial balance through the diminution of energy imports. The private natural gas industry sector in Colombia is one of the most dynamic ones, and with a strong potential for development in the country, due to large private investments, to the support of the national government and the development of a vast infrastructure. The National Government reckons that with right market signs, the NGV program in the main cities of the country might increase its weight in the national energetic basket. Likewise, it will pass from having 2.2% of the total natural gas demand to 8.5% of the total estimated demand of this fuel for year 2010, achieving the economical and environmental benefits that the country needs. NGV’s participation in the total national consumption of natural gas during the year 2003 was 2.2%, which represents a 26% increase in NGV consumption regarding year 2002, due to an increase of 10.000 vehicles converted during 2003. To this phenomenon is added the great existing natural gas reserve availability (7,489.7 GPC3), that at a supply rate as the one had in year 2003, 573 MPCD, will provide available reserves for 34 years. It must be acknowledged that exploration activities have decreased during the last few years and that will probably force us to buy international priced petroleum from the next years on. The reserves of our neighbor Venezuela establish a warranty for an eventual compliment of our actual reserves. It is then evident to conclude that there is an existing natural gas reserve availability for a successful development of Natural Gas Vehicles in Colombia. As a result of the successful experience with the Transmilenio system in the city of Bogotá, Colombia’s main cities are willing to reorganize their public transportation system and offer into service integrated massive transportation systems with buses operating at surface level. Taking to account that the petroleum reserves let us have a 4-year self-sufficiency and due to the quality of the fuel produced in Colombia, the government is encouraging people to use natural gas as an alternative fuel for their vehicles. For this purpose it issued the October 2003 2988 Decree through the Ministry of Energy and Mines, that makes the operators of this projects consider the international price for Diesel (without subsidies). It must be said that Diesel fuel had a 60% subsidy, provided by the National government. Today this support goes down to 40% and it is expected to decrease gradually till it is totally eliminated in December 2005. It has been proven that the pollution emitted into the environment and the noise levels produced by natural gas vehicles are amazingly less than those produced by equivalent Diesel powered engines. 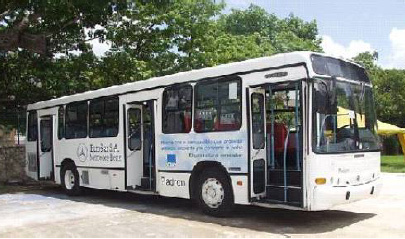 The buses required for the future projects that are being developed for the cities of Cali, Barranquilla, Cartagena, Pereira, Medellín and Bucaramanga, and the future extensions of Transmilenio goes over 1.000 vehicles. 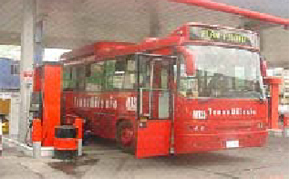 The following buses with natural gas powered engines are available in Colombia today: Since the end of year 2003 an Ikarus articulated bus, with natural gas engine, has been operating in Bogotá-Colombia in one of the Transmilenio system routes, with excellent results from both technical and economic points of view. 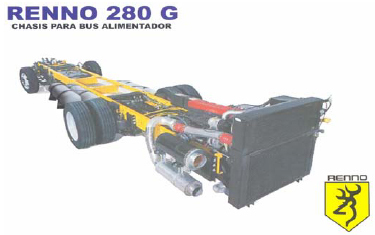 a) Articulated Bus, Ikarus (160 passengers) Since the end of year 2003 an Ikarus articulated bus, with natural gas engine, has been operating in Bogotá-Colombia in one of the Transmilenio system routes, with excellent results from both technical and economic points of view. Nowadays, several cities of Colombia such as Barranquilla, Cartagena, Santa Marta, Sincelejo, Montería, Neiva, Bogotá, Bucaramanga, Cali, Medellín, Armenia, among others, are using natural gas in approximately 35.000 vehicles, especially in public transportation. 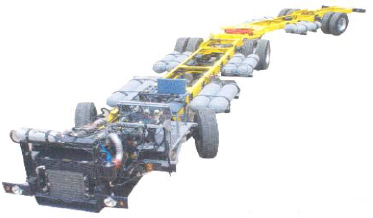 Taking this to account, the competent authorities and the industry itself have identified the need of creating legal and technical regulations, guided so that every natural gas converted vehicle can be provided with fuel at any place of the country, under the fundamental premise of minimizing the possible security risks of the customers and the public in general. Many of these risks are present in the usage of any type of fuel, and, if not managed in the right way, may cause accidents affecting the development of the industry’s activities. The Colombian companies gnc S.A. and Gas Natural S.A. have been pioneer in the implementation of an automated sale control system in its entire refueling stations network. It is called “Joint Information Unique System (SUIC in Spanish)”. Through this system, any operation risk or the possibility of existence of a human error is minimized. Every vehicle has installed an electronic identification system that is qualified by the certifier at the time the conversion takes place and requalified during the car’s annual inspection. The system identifies the customer’s recorded information with an electronic device (Chip) and authorizes the fuel supply. The system allows vehicle identification and control of the complete NGV equipment for the annual and 5-year checking so that such vehicles are not supplied with fuel if the chip notices that it has not had the proper revision control. The Colombian NGV Industry remarks the adopted dispositions on the subject as a mean that will help guarantee security and create a quality culture around the NGV business. After being proved by the private sector that natural gas is not only an alternate fuel for engine vehicles, but that represents a real substitution option for more expensive traditional fuels (subsided and less friendly with the environment), the industry of NGV will for the first time count with the means that allow it to take natural gas as fuel to many more users in different cities of the country. This support (NGV massification program) includes the cutback of taxes in the conversion kits, elimination of mechanic shops and service station implementation procedures, and the elimination of traditional fuel subsidies. Besides, the government is conscious of the favor this would do to the country’s economy by finding a substitute for fuel imports, with the consequent foreign currency savings. Essentially, these instruments are the incentives regarding the commercial discounts to those new clients interested in converting their vehicles to natural gas fuel that could be provided today. 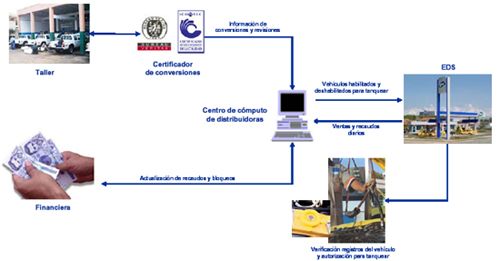 This discount is the result of an alliance between the producers (Colombian Petroleum Company ECOPETROL-Government and CHEVRON TEXACO), conversion workshops, transporters (ECOGAS), fleet owners, dealers and marketing managers, among those gnc S.A., and the purpose is to offer incentives in order to increase the NGV conversions and as a consequence, NGV consumption. There are proposals to promote the use of natural gas in public transportation with vehicle parts that could be made in Colombia. It is not a secret that a greater use of natural gas increases economic global competitiveness by means of a diminution of transportation costs. According to the established goals for the next five years, the NGV program in the country estimates the conversion of nearly 200.000 new vehicles that constitute the actual potential market. It is expected to build 200 new service stations during the next 5 years, in order to reach a total amount of 280 at the end of the year 2010, which represents investment needs of US$ 550.000 per station. Mechanical workshops constitute a fundamental element in the development of the program because their job is to assure the security and safety during the vehicle maintenance. The number of workshops to build depends on their own average conversion capacity, and it has been calculated in 50 units per month. There are around 20.000 new conversions expected for the present year, which will require an amount of approximately 70 workshops. 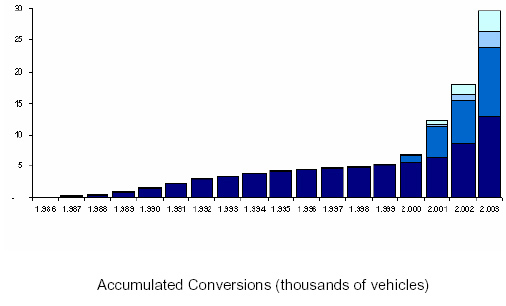 Nowadays, the country has the necessary infrastructure to double the actual conversion rate. It can be concluded then, that the massive natural gas program will have a considerable advance during the present year, achieving important economic and environmental benefits for the country. A new era is opened for this energetic today in Colombia; after 20 years, we are still successful in public fleet transport: taxicabs, large and mid-size buses.